The following two examples illustrate the difference between setting positive and negative offsets. Using these parameters, Autotrader submits a bid for a 10 lot (the Bid Quantity) one tick lower (the Bid Offset) than the best bid price. Using these parameters, Autotrader submits a bid for a 10 lot (the Bid Quantity) one tick inside the market (the Bid Offset). The examples assume the Cover Order Offset is set to 2. After a bid for 20 is filled at 50, Autotrader submits an offer to sell 20 at 52. After a bid for 20 at 50 is partially filled with a quantity of 10, Autotrader submits an offer to sell 10 at 52. You link a Theoretical Generator into the fA cell in the Formula section and rename the formula column to TheoOffset. This generator creates theoretical offsets. Currently, the theoretical offset is 2. The TheoOffset cell displays a theoretically generated offset of 2, and the fB cell displays the formula you entered. As soon as you click another cell or press ENTER, the value of the fB cell changes and displays only the dynamic value of the sum of the theoretical bid offset (TheoOffset cell) and the market ask price (mAskPrc cell). To use the value of the fB cell, simply type =fB into the cell in which you want the value to appear. You can further use this value (fB) in other more complex formulas. This formula takes the numeric market bid price of the contract in row four and subtracts 25 from it (equal to one tick in the E-mini S&P). If the bid price in row four is expressed as 10025, your value appears as 10000 (one tick lower). In the diagram below, the Contract column has the column letter C.
To view column letters click Column Headers under the Show/Hide Rows option in the Autotrader context menu. Reference cells in other rows by their column name or column letter followed by the row number or RowName. Do not include a space between the column name or letter and the row number. In this example, you reference the market ask price for the NYSE Liffe US-A YM Dec08 contract in another row. To do so, you enter either =P3 or =mBidPrc3. This example assumes the Market Improve Limit is set to 2. The current market has a best bid at 40 and a sell at 45. Autotrader receives a theoretical price input that generates a bid for 43. This bid is three higher than the market and exceeds the setting in Market Improve Limit. Autotrader adjusts the order to 42. This bid betters the market by two points, which is within the Market Improve Limit. After you start Autotrader, the market begins sliding downward and starts taking out your bids. After nine of your bids have been taken out (9 X 10 = 90), none of your offers or cover orders have been taken. Because your next Bid of 10 could exceed your maximum allowable position, the Position Management window appears, prompting that your quote exceeds your maximum position. You can now only continue trading your Bids if you either hedge your Open Position or increase your Max. Position Limit. Because the value of the Apply To Hedged field defaults to your current Open Position, you can click the Apply To Hedged button. Your entire Open Position becomes hedged, and Autotrader begins to submit Bids to market according to your profile setup. Previously, the Autotrader Maximum Position only tracked the Open Position based on contract and expiration. Now, you can set the Maximum Position to track your position for trades that only occur in the row. This RowPos option on the Profile Setup Page, works in conjunction with a new column on the Autotrader grid called RowPos. 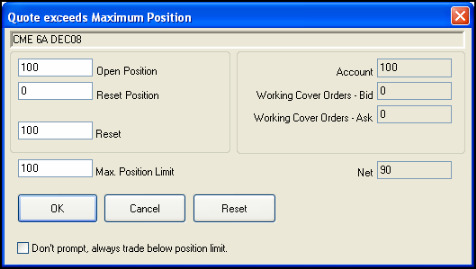 Row Position displays your open position for orders traded using the Autotrader strategy in that row. Example: You configured two different Profiles for the same contract, say the ES JUN 11 - Profile A in row three and Profile B in row four. Profile A in row three generates trades that result in an open position of long 20 ES JUN 11. Profile B in row four generates trades that result in an open position of short 10 ES JUN 11. In this example, the OpenPos column for both rows in Autotrader displays long 10 for ES JUN 11. But the RowPos column in row three displays an open position of long 20, and the RowPos column in row four displays an open position of short 10. The values in the RowPos field in the Autotrader grid can be reset using the Hedge Open Position button on the Control bar. The profile's Throttle Quoting is set at 500 milliseconds. The row's profile is set with Bid and Ask Offsets of 1. The Market Bid Price is 100. The Market Ask Price is 105. This example illustrates how the current bids and asks displayed in the Scratch Pad can differ from your working bids and asks. Autotrader sends its quotes into the market: a Working Bid at 99 and a Working Ask at 106. After 100 milliseconds, the market moves to 101 as the best Bid and 103 as the best Ask. The Scratch Pad updates its values to display 100 in the sBidPrc column and 104 in the sAskPrc column. After 300 milliseconds (for a total of 400), the market bounces back to 100 and 106. The Scratch Pad reverts to displaying 99 in the sBidPrc column and 106 in the sAskPrc column. The working Bid and Ask remain the same (99 and 106). After 100 more milliseconds, the throttle quoting expires. Because the Scratch Pad and Working order sections match, Autotrader makes no changes to the working Bid and Ask. This example assumes Autotrader is configured with 500 milliseconds between quotes. Example: Autotrader submits a quote to market. After 200 milliseconds, the market moves enough to trigger the need for a new quote. However, Autotrader does not submit this new quote until 300 more milliseconds pass (for a total of 500 milliseconds). Note: This new quote is based off of the current market position. If the market moves back to its original position during the 300-millisecond time frame, Autotrader submits a quote at the same price as the original.